Technomads get around. Their love for adventure knows no bounds. 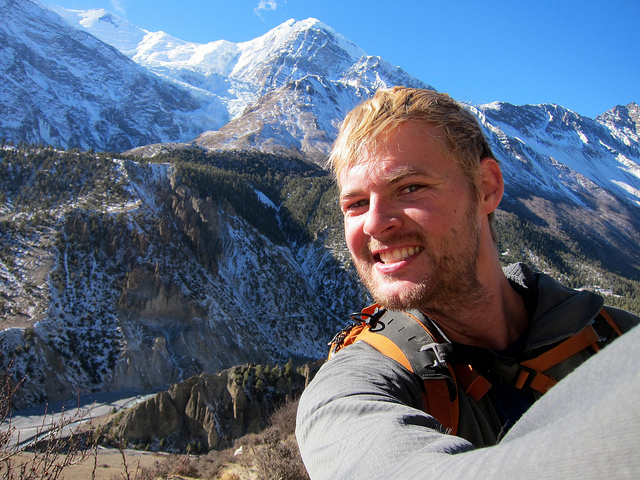 In the case of Andrew Hyde, his journey has included such adventures as climbing a 17k foot mountain pass in Nepal; wandering the streets of Tokyo; hiking through jungles to the “Lost City” of Sierra Nevada, Columbia; relaxing on an island beach in Krabi, Thailand; running an Ironman; spending 3 months helping out at a guest ranch in rural Colorado; and currently organizing a TEDx conference in Boulder, Colorado. Andrew is a tech-savvy, startup building, community- organizing world traveler. He started his “big trip” in August 2010 that has turned into a nomadic journey. During this past year he has been to 15 states in the USA and 22 countries, primarily in South America and Asia. One of Andrew’s favorite parts about this adventure is that it has given him, as he explained, “an incredible freedom to say yes to life” in so many new ways that he hadn’t experienced in his previous lifestyle. For Andrew, adventure comes in all shapes and sizes, encompassing not only travel but also the realm of entrepreneurialism, startups, technology, and community engagement. Andrew loves engaging with creative change makers, helping entrepreneurs, and contributing to his community. He has founded TEDxBoulder, Ignite Boulder, Startup Weekend,boco, and Venture Capital Wear. In addition to these passions, he also has an eagerness to travel the world, greatly inspired by Rolf Potts’ Vagabonding . In August 2010, Andrew quit his job with TechStars and began preparing for his nomadic journey. He planned out the first 4 months and decided to figure out the rest as he went along. The international portion of the trip would last 11 months and take him to such countries as Costa Rica, Japan, Taiwan, Columbia, Thailand, Nepal, Panama, Taiwan, and China (22 countries total). During this trip he regularly shared his adventures and pictures on his blog, primarily using an iPad. His adventures gave him the opportunity to see incredible natural beauty, meet interesting people, encounter different cultures, and experience personal change. In preparation for the trip, Andrew embraced minimalism. He sold and gave away most of his possessions, only keeping 15 items to bring along with him. He took quite a unique approach to getting rid of his stuff. During a large dinner party at his house shortly before the trip, he announced he was getting rid of all of his possessions and that his guests could take anything they wanted from his house. Everyone responded with silent stares of confusion. They couldn’t tell if he was serious nor why someone would give away everything they owned. By the end of the night though, his house was empty. Since then, Andrew has learned to live with only the bare essentials. Though the number of things he owned has fluctuated over the past year, it has always remained below 60 items. Andrew joked that he owns more domain names than possessions – the sign of a true technomad. Minimalism has influenced Andrew’s sense of identity. He lamented that in his experience, many people often evaluate others and themselves based on their ownership of possessions. By embracing minimalism, Andrew has been forced to face his own sense of identity. He remarked, “I’m homeless, unemployed, and own a backpack. The only difference between me and a beggar on the street in San Francisco is a credit card.” He explained, “when you strip yourself down to only owning a few things, you force yourself to give up other people’s opinions of you.” With this act of letting go of people’s expectations and opinions, it has given Andrew the freedom to say “yes” to pursuing the experiences he values most and help him to disregard disparaging opinions. When asked if Andrew uses the term nomad or technomad to define himself, he responded, “I generally just say ‘weird.’” He knows quite well that his lifestyle is unique. He acknowledges “I’m weird so other people can be too.” He emphasized that the more we can be ourselves, the more it helps other people to authentically be themselves. He emphasized how living nomadically isn’t always easy and sometimes may not be particularly interesting or exciting. He found that at times during this experience he has missed the rhythm of routine from his former life. Andrew shared that sometimes he really questions what he is doing. He wonders about things like how it’s possible to create a romantic relationship when you are nomadic and living out of your backpack. But he recognized that “Travel, at its core, is opening your heart to possibility.” He reflected that he is happy about all the experiences he has had and is excited to be able to share his story. Andrew emphasized the importance of being authentic about what you want when pursuing a nomadic life. He shared that “if you are honest with what you need right now, just go and do it. If you want to travel and party, go and do it. If you want to travel and go hit on girls [or guys], go and do it. But for me, I just wanted to sit down and be simple.” Andrew’s nomadic experience has been an opportunity for exploration, learning, and simplicity. In a blog post on the ways that his travels have changed him, Andrew shared: “I am [more] patient. I appreciate more. I eat less. I’m happier…I learned how I react to someone having a seizure, to someone breaking my heart and what it feels like to look different, talk different and feel different.” His travels expanded his understanding of what he values and gave him insights into what other people value. Though he admits that he will probably settle down one day, for now, he continues to say “yes” to the technomadic life. What life will you say “yes” to today? Love the way this emphasizes that reducing to essentials moves life to art–letting go of stuff that doesn’t matter to make space for what does matter.